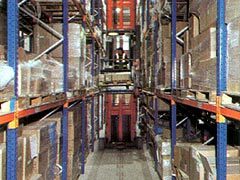 When space is at a premium and a high degree of flexibility and access to stock is required, narrow aisle racking provides an ideal solution. This system is therefore ideal for installations where space is limited. Contact us now and find the right Narrow Aisle solution for you! The racking structure is firmly secured to both the floor and ceiling of the warehouse space and the special fork lift trucks are guided by wires or rails at floor level, which eliminates the potential for the trucks to come into contact with the racking structure, ensuring safety and minimising accidental damage to both racking and stock. Our design and installation service provides an efficient and stress free way not only to install your new racking system but to ensure that it is configured to meet your precise requirements. Narrow Aisle Racking Systems. Call us on 0161 775 7178 or contact us below! If you think a narrow aisle racking system might solve you space problems, call us today on 0161 775 7178 or fill out the form below.